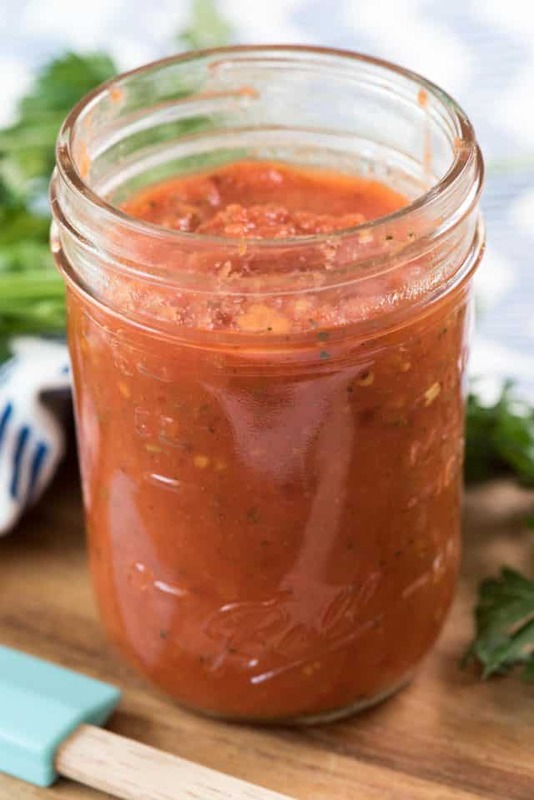 Easy Homemade NO COOK Pizza Sauce – this recipe is ready in 5 minutes with ingredients you already have! 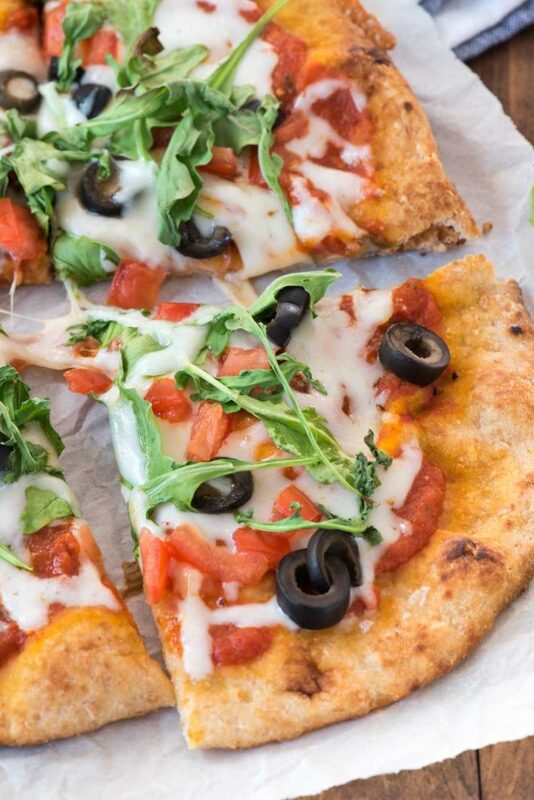 Homemade pizza is just minutes away. 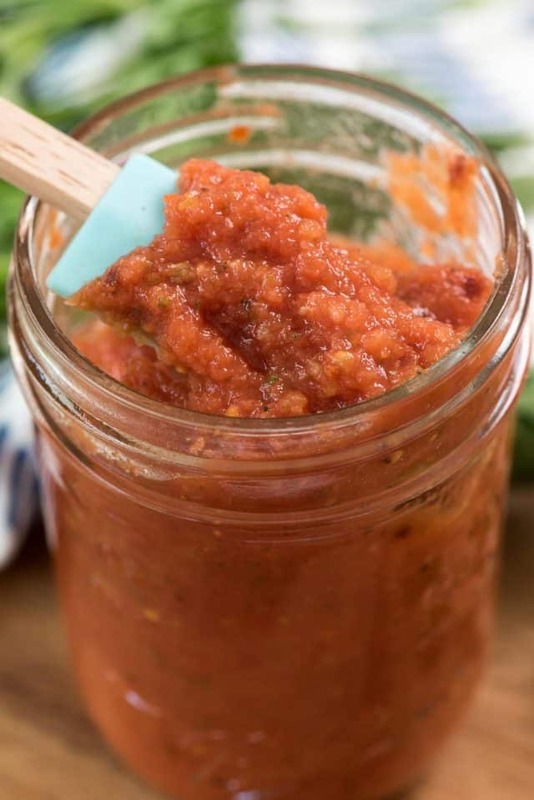 The flavor of this homemade sauce is tastes even better than the pizza parlor and it’s made at home, where you control the ingredients. Homemade pizza is one of the best things in the entire world, isn’t it? I mean, I could eat pizza every single day and be happy, so making it at home saves me money. 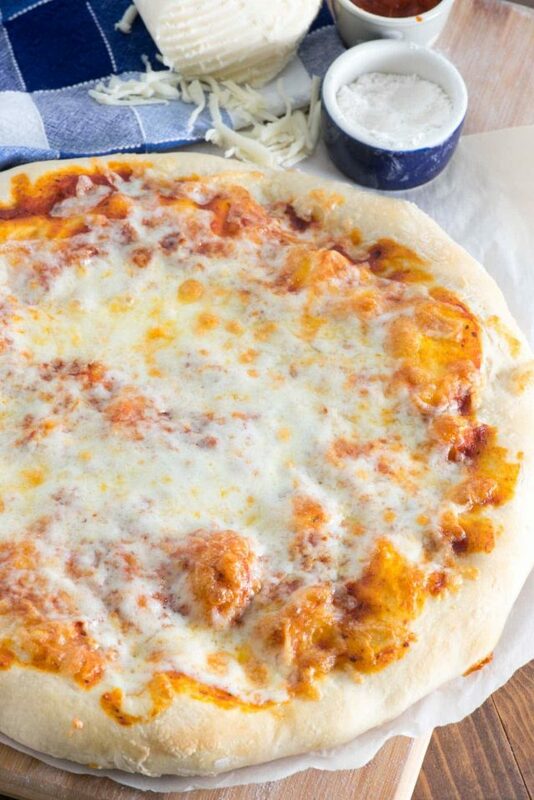 We make pizza constantly so just looking at the photos of this sauce makes me think of Friday nights and sleepovers. For a long time after I started making my homemade pizza dough, I would buy store bought sauce in a can or a jar. Honestly, I kind of cringed every time I used those, because I didn’t really like them that much. I wanted something fresher and more flavorful. Sure, in a pinch, squeezable pizza sauce is okay, but if you’re going to make your own pizza dough, then you should make your own sauce too! All you need are a few fresh ingredients and a food processor and you’ll have the most flavorful sauce you can ever imagine. Flavor is key when you’re making pizza sauce. There are just a few ingredients so each component is crucial. Well, you ask, what’s the difference between pasta sauce and pizza sauce? Honestly – not much. They’re both tomato based sauces, but sauce used on pizza is often thicker with less liquid so that the dough doesn’t get soggy. And, in the case of this sauce, it’s simpler to put together, with fewer ingredients, and no cooking. When I make marinara sauce I add lots of ingredients and spices and cook it for hours. When I make pizza sauce I throw a few things in the food processor and call it done. How do you make the easiest pizza sauce? You just need a few ingredients. The best part about this is that it’s no cook; there’s no need to wait for it too cool. I start with canned diced tomatoes. You can use whole peeled tomatoes, or you can even try this with fresh, but for convenience I use canned. 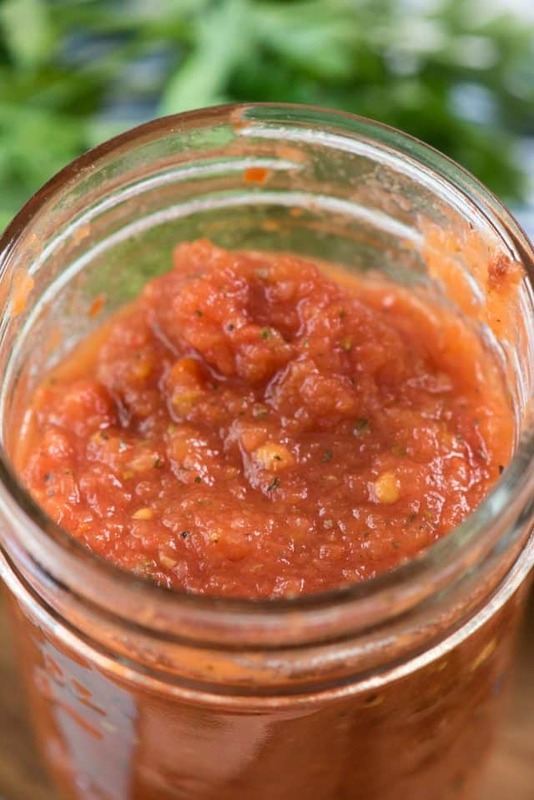 I always have diced tomatoes in my pantry so it’s easy to just grab one for this recipe. To the tomatoes, I add oil and red wine vinegar, for tang, as well as Italian seasoning and garlic. I also add a touch of honey to balance out the flavors. Homemade Pizza Sauce is no cook and easy to make with just a few fresh ingredients. Once I blend all the ingredients in a food processor, I strain them using a fine mesh strainer. This helps the sauce be less wet and ensures the dough doesn’t get soggy. Sometimes canned tomatoes have more liquid than others, so the need to strain will depend on that as well as the brand of tomatoes you use. I highly recommend using a high quality brand (like Hunt’s or Contatdina or San Marzano) instead of using a store brand. If you don’t have a strainer, you can line a bowl with a few paper towels and drain this that way too. Either way you end up with a nice thick and fresh sauce for your Friday night pizza night. One recipe of this sauce makes enough for about 2 large pizzas. I often use half and then freeze the rest for the following week when I know we’ll want pizza again. In a pinch, I’ve also used this sauce on pasta, just slightly warmed and topped with lots of parmesan. It’s has amazing flavor! Easy Homemade NO COOK Pizza Sauce - this recipe is ready in 5 minutes with ingredients you already have! Homemade pizza is just minutes away. Pour sauce into a fine mesh strainer and let the excess liquid drain out. Store in an airtight container in the refrigerator for up to 3 days or freeze for up to one month. This makes enough sauce for about 2 pizzas, depending on size. Looks like a winner! I love all things tomato! Hello Dorothy…! 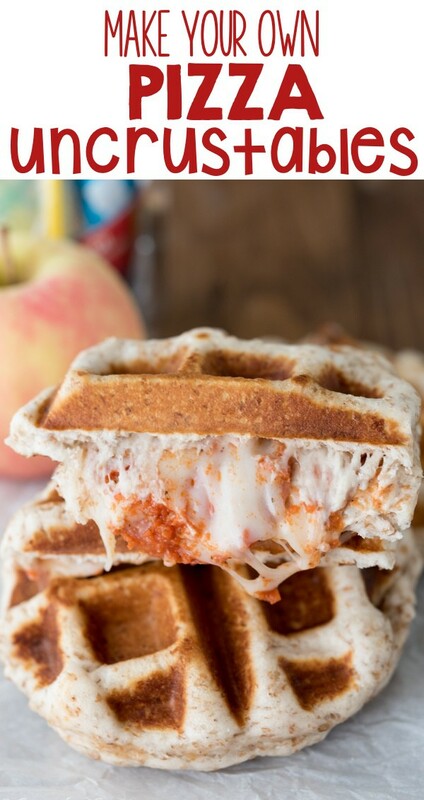 am always find some this recipe and your sauce looks soooo yummy & delicious i will trying to making this in upcoming weekend. Thanks for sharing and keep shared your new ideas…! The sauce is delicious, this dish is great.